Beets are rich in nitrates, which the body converts to nitric oxide. Nitric oxide is a compound that relaxes and dilates blood vessels, providing improved circulation and potentially lowering blood pressure. Beets are rich in the B-vitamin, folate, as well as betaine, a plant alkaloid. Together, betaine and folate can help lower blood levels of homocysteine. Elevated homocysteine levels are associated with heart attack, stroke, and blood clots. Known research suggests the nitrates found in beets can boost endurance performance, making this an excellent choice for the competitive athlete. Consuming WAR FUEL before your workout, gives your body the elevated nitrate levels to improve your stamina to give you the potential to make new records in your overall performance. Nitrates benefit your body in many ways. As mentioned, the converted nitric oxide relaxes and dilates your blood vessels, which in turn increases blood flow to the brain. This improved blood flow could contribute to better brain function. As we age, this is a particularly important aspect of our health as we tend to generate less nitric oxide as we get older. With dementia and Alzheimer’s affecting nearly 1 out of 10 people over the age of 65, is it good to find a convenient source of beets to help improve vascular dilation. Betaine, the amino acid found in beets, helps to prevent, and reduce the accumulation of fat in the liver. Betaine research has shown that people who consume foods with betaine (beets, quinoa, and spinach for example), experience improved liver function, slight decreases in cholesterol, and a reduction in liver size. Beets are also rich in betalains, potent antioxidants and anti-inflammatories that battle free radicals and inflammation in your body. Research suggests that betacyanin, the pigment that gives beets its pretty color, may help protect against common carcinogens. Watermelon is another amazing source of vitamins and nutrients that have been linked to a host of health benefits. In addition, watermelon juice helps improve endurance and reduce muscle soreness.WAR FUEL not only contains the juice of the watermelon but also the rind. The rind is actually edible and contains plenty of health-promoting and blood-building chlorophyll. In fact, the rind contains more of the amino acid l-citrulline than the pink flesh. Citrulline is converted to arginine in your kidneys, and not only is this amino acid important for heart health and maintaining your immune system, but it has been researched to have potential therapeutic value in over 100 health conditions. Read on for more information on l-citrulline and the benefits of watermelon. Watermelon is an excellent source of lycopene, even higher than tomatoes. Lycopene is a powerful carotenoid antioxidant linked to many health benefits. WAR FUEL is formulated with watermelon which contains a l-citrulline, an amino acid that has been found to protect against muscle pain in some people. Drinking WAR FUEL prior to a workout can potentially reduce muscle soreness. Watermelon is also high in carotenoids, including beta-carotene and lycopene. Plus, it has citrulline, an important amino acid that supports the immune system, the heart, and overall health. There are two unique substances in pomegranates that are responsible for most of their health benefits. Punicalagins and Punicic Acid. Punicalagins are extremely powerful antioxidants found in the pomegranate juice.They offer 3 times the antioxidant benefits of red wine and green tea, that’s how powerful pomegranate juice is! Punicic acid, also known as pomegranate seed oil, is a fatty acid found in the arils. Punicic acid is a type of linoleic acid with very potent biological benefits. The punicalagins give pomegranate its anti-inflammatory properties. Studies have shown pomegranate juice can reduce inflammation, one of the leading drivers of many killer diseases. High blood pressure (hypertension) is one of the leading causes of heart attacks and strokes. Regular intake of pomegranate juice has been shown to lower blood pressure. Since the plant compounds in pomegranate are known to have anti-inflammatory effects, it possible that with regular consumption they could help reduce arthritis. Pomegranate is rich in nitrates, which have been found to improve exercise performance. The body converts the nitrates to nitric oxide, which relaxes and dilates blood vessels, providing improved circulation, and potentially enhancing performance. 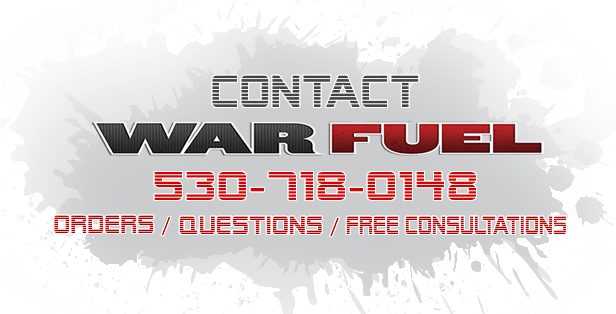 The finest organic ingredients are used to formulate the WAR FUEL sport hydration beverage. This amazing drink is healthy, convenient, and suitable for people of all ages and activities levels. Get yourself a glass of health today! ORDER TODAY AND WE'LL PACKAGE AND SHIP YOUR ORDER RIGHT AWAY! 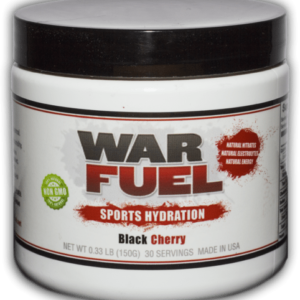 GET COMPETITIVE, GET YOUR GAME ON, GET WAR FUEL!! !